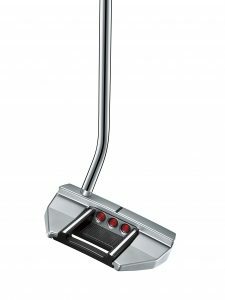 The new Scotty Cameron Futura 5.5M adds a high-MOI mallet with enhanced toe flow to the Futura line of putters. It combines the forgiveness of a mallet with the feel of a blade. Inspired by Cameron’s work with players on the worldwide professional tours, the Futura 5.5M offers a new mallet option featuring the alignment and high-MOI characteristics of the Futura line coupled with a neck configuration that promotes a flowing, arced putting stroke more commonly associated with blade style putters. • The compact mallet — about 10 percent smaller than the similarly-shaped Futura 7M — is designed for easy alignment with built-in toe flow. • Multi-material technology — featuring wrap-around face-sole construction milled from lightweight 6061 aircraft grade aluminum, integrated with precision-milled 303 stainless steel — moves weight back and to the perimeter, allowing for a larger putter head with enhanced high-MOI performance (resistance to twisting during the stroke). Each new Futura putter features advanced stability weighting with removable, customizable stainless steel sole weights,stepless steel shafts and supple Black Matador Mid-size grips with red and gold accents (Futura 6M DB employs a 15-inch Dual Balance grip) developed to offer the comfort of a larger grip while maintaining responsiveness and feel.